It’s H-O-T in the H.O.T. , people. I mean HOTTTT! I can’t believe it’s been in the triple digits already. And when it’s this hot, it makes outside playtime kind of un-fun. However, with a toddler we have to schedule some outside time in to our day; we’ve just moved it to the morning. So that leaves the rest of the day. What in the world do we do? Well, here are a few ideas. Some are for those days when you’re enjoying time at home, and the rest are some things you can do around Waco. Our family is going through the alphabet with Hudson, so some of these ideas will go along with the letter we are learning for the day. (Here are some ideas for an ABC Adventure if you’re interested.) What are your plans? 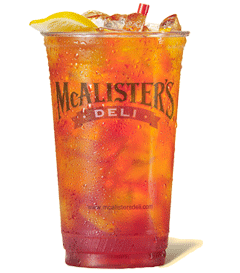 Leave a comment or suggestion for these dog days of summer, summer, summertime! 1. Make a marble racetrack. 2. Go to Pinwheel Kids and play on the slide. 4. Take a trip (or several trips) to the Mayborne Museum. 6. Visit a local fire station. A friend told me you can show up to any Waco fire station on Saturdays and get a free tour, stickers, sit in the trucks, wear the gear, etc. I think this is wonderful! 7. 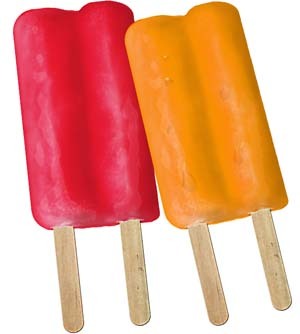 Make yogurt popsicles. I can’t wait to try this! 8. Visit one of Waco’s library locations. I saw that the Central Library will be closed for renovations, but they have a temorary location. 9. Read the books you checked out from the library!! Duh! 10. Take your dog to Dogtopia where you can use one of their self wash stations. And there’s so much more! Get creative! This is a wonderful time to explore Waco and all it has to offer! I thought this would be a good time to talk about our newest little addition, Miss Ruby Claire, AND brag on a fairly new shop in Waco-Pinwheel Kids. Sooo, Ruby Claire first! I took my maternity leave from school beginning May 9, fully expecting to go in to labor early. I don’t know why I thought this would happen, but I did, and low and behold she didn’t show up until her exact due date. My water broke at home around 8pm on May 15th, we waited for about an hour because I wasn’t quite sure if it had broken, and then decided we’d go ahead and go to the hospital with hopes they’d go ahead and induce. I never wanted to be induced, but those last few days are just miserable. So we headed to the hospital and sure enough water had broken and beautiful Ruby Claire arrived around 5:30am, weighing 8lbs 4 oz. 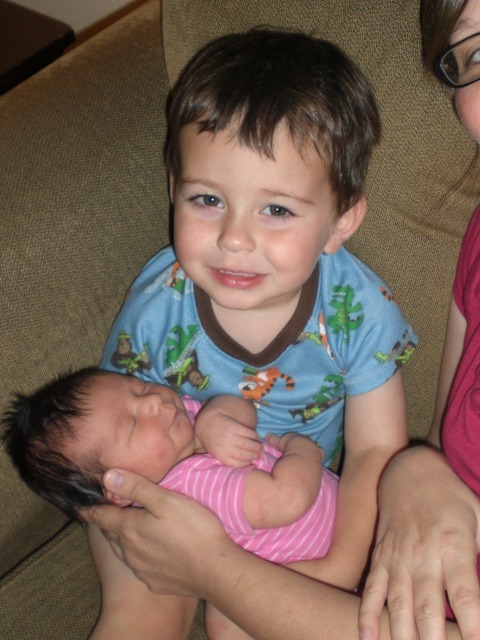 She’s precious and doing really well, as is her big brother who really loves her (most of the time). While I’m waiting on this baby girl to get here, I might as well blog right? I took my maternity leave early because I really thought she’d be here by now. My dr. said she thinks it will be this weekend so we’ll see. Speaking of maternity leave….I took said leave from Rapoport Academy. I’ve been teaching there for 3 years, and what an amazing 3 years it’s been. If you’re familiar with Waco at all, you know the choice of schools is as diverse as anything else Waco has to offer. But Rapoport is just different. I’ve worked in large public schools, a private school, a small public school, and then Rapoport, a small inner-city charter school, and it’s just different. My journey getting there was an interesting one. We’d moved to Waco in 2007, and I’d immediately gotten a position at a small ISD just south of Waco. The drive was not fun, and we found out that spring we’d be having Hudson in November 2008. Additionally I’d become incredibly interested in social work due to the amount of poverty in Waco, and I was very close to going to grad school for my masters. 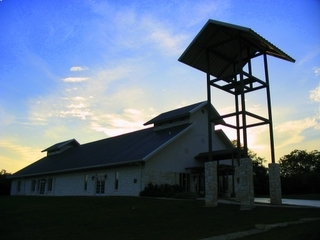 I talked with a guy we’d met at church who was a social worker and he led me to one of the directors at Mission Waco. I’d volunteered with them, and the work they do in Waco is incredible! I’ll blog about them later for sure! The director and I chatted one afternoon and by that time the pregnancy made me second guess the whole masters thing, so she suggested Rapoport Academy. I checked it out that night, had an interview the next week, fell in love with the way they practiced education, and was hired the week after that! So what’s so different you ask? 1. It’s TOUGH! Students and staff are pushed everyday to be better and do better. 2. I was allowed so much freedom and creatvity in the way I taught. No cramming TAKS down anyone’s throat here. 3. The kids, while challenging at times, were fabulous, and at the end of the day wanted to be there whether they knew it or not. : ) 4. I got to wear jeans and my nose ring EVERYDAY! O.k. I know it sounds kind of trivial and maybe a bit selfish, but it wasn’t about dress suits and closed toed shoes at Rapoport. It was about learning and being comfortable enough to go romp around outside if that’s what that day’s lesson required. The founder and superintendent (who happens to be Wacoan of the year) wore overalls and gardening shoes most days because until recently, she was the one who did the lawn. You’d find many of our master teachers and dean of students in Chacos, sneakers, flip flops, etc. because everyone’s wardrobe wasn’t what was on our minds. Kids were on our mind, and our hearts, and hanging on our arms bugging us until we couldn’t help but love em’ ; ) 5. It was family friendly-I had to bring Hudson to work with me on 3 different occasions, and one of those times, changed a diaper on the floor of my superintendent’s office….while she was working. Two of the master teachers have kept Hudson on numerous occasions, and my dog a couple of times too. I’ve never had that kind of support anywhere else. All this said because my maternity leave was more than maternity leave. It was the end of a very important part of my life as I’m now moving on to a new phase with Read Smart Services, an academic service here in town. It will allow me to go part-time and be with my kiddos more. But I would not trade the years I spent at Rapoport for anything. If it’s the last place I teach, I’ll be more than happy with that. I truly believe it shaped me for this next job, and has equipped me to work with my next round of students at Read Smart. I could seriously go on and on, but overall, I don’t know how I’ll ever work at another school without comparing it to my experieces at RAPS. Like I said, it’s just different. You can drive almost anywhere in Waco and find a place of worship. And they range from traditional, to meeting under bridges, big, small, and anything in between. My family and I have attended Dayspring Baptist Church since we moved to Waco, and being part of this congregation has been incredibly challenging to our faith journey. I grew up in Baptist churches, but my husband grew up Catholic, and somehow Dayspring manages to meld the traditions and practices of each denomination in a beautiful way. I’ve learned so much since joining Dayspring. I’d never followed the church calendar before, and always assumed Advent and Lent were something Catholics practiced. New meaning has been attached to so many traditions I grew up with that were either never explained to me, or I just took for granted (communion, holidays, baptism, etc.). All in all, it’s been a wonderful church experience for the Pereiras. Up to the highest height….What is that from? Mary Poppins? Anyway, isn’t there something so wonderful about kites? Makes me feel like a kid again! 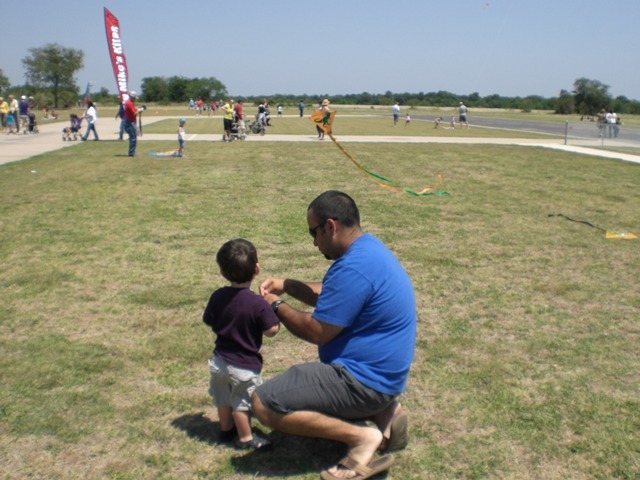 Waco held it’s 5th annual Sertoma Kite Festival on Saturday, May 7, and it was such great family time. 1. It was free. 2. 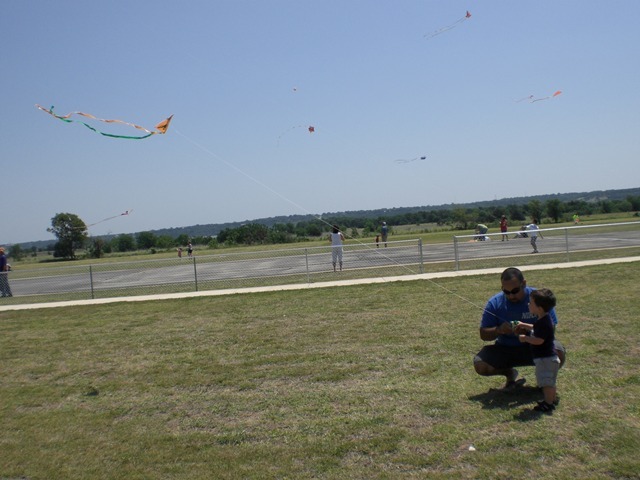 They gave out free kites, but if you missed those like we did, they had some affordable ones for sale. 3. There was food. 4. There was music. 5. There were…KITES! 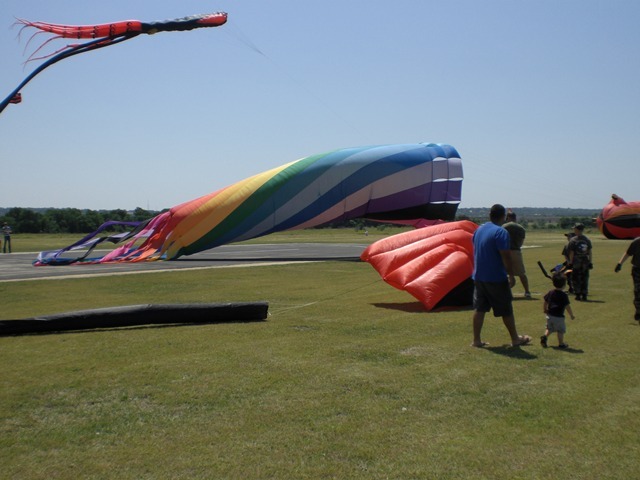 And kites of all sizes. Some were itty bitty like the one we purchased for Hudson. Some were enormous, and had to be attached to the ground, while others were shaped like various animals. 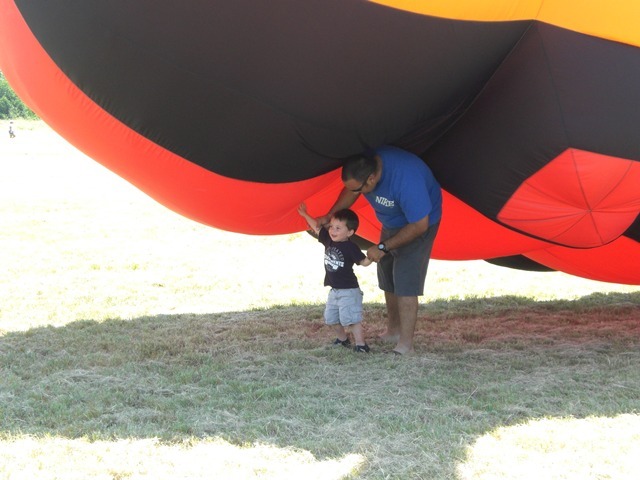 The wind was blowing, and the kids were having an amazing time. Sounds like a darn good Saturday to me. Enjoy the pictures! This past week the Waco Tribune-Herald had a great group of articles dedicated to local Waco artists of all different genres. One of the artists happened to be Joel Edwards. We attend church with Joel and his lovely family, and boy is he talented. I mean, take a look at Joel’s digital painting of the suspension bridge! Amazin’ I say! You should be able to click on it for a larger view. I plan to do posts on each of these separately in the future. In the meantime, go get some art in your life! Happy weekend!